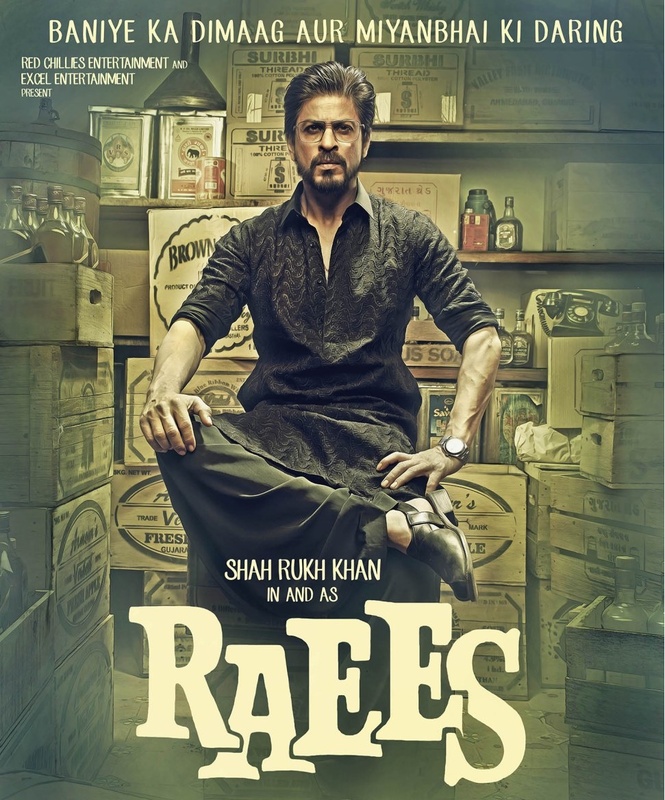 Cast: Shah Rukh Khan, Nawazuddin Siddiqui, Mohammed Zeeshan Ayyub, Mahira Khan. A bootlegger in Gujarat with a flair for business wants to scale up his operations, but an honest cop, competition, politicians and restrictions imposed by his own conscience stand in his way. Masala movies form the backbone of the Indian film industry, they promise entertainment and cheap thrills - unapologetically. And while masala is aplenty, you know good masala from the rest. Raees had built up expectations from the moment it was announced, SRK may have become King Khan thanks to his lover-boy roles, but box office numbers aside, it's whenever he plays the anti-hero or dons the role of a character of questionable motives that he really lights up the screen. Yep, no one plays the bad guy as well as SRK, and after a string of not-so-successful-films; this one definitely seemed like the one in which SRK was revisiting the kind of roles that had made a star out of him. SRK mouthing one liners that became catch-phrases even before the release, Nawazuddin playing the cop out to get him, a critically acclaimed director.....this had good masala written all over it. Unfortunately, it's just another film that everyone will forget about in two weeks time. There's a very good movie hiding in Raees somewhere, but it's lost in the layers and layers of chaff. Like the central character, the movie tries too hard to be too many things at once, so we have a bootlegger for whom bijness is bijness, and bijness is supreme (no he doesn't say that in the movie, not in those many words), but wait, the second law of bijness keeps his villainy in check, bijness is supreme but no bad act allowed. Ahh, a criminal with a heart of gold. The movie does start off well, and the younger actors do a fabulous job, but it was as if someone told the maker mid-way that the movie won't work because of certain issues. Issue 1: Lead character too evil. Solution: Enter second law of bijness. Issue 2: Lead character still too evil. Solution: Okay, for every bad thing he does, let's make him do two good things. Keep a count. Issue 3: We have to cater to an audience who want to see SRK romance. Solution: Write up an unnecessary romantic track. Solution: Insert tacky action sequences giving SRK the ability to dodge bullets and defy gravity. Solution: Just mention the words in passing. Issue 6: No Sunny Leone!? The result is a dumbed down version of a movie that caters to everyone and yet, no one. The closest thing to a redeeming factor is Nawazuddin, he is getting typecast, but still manages to make the most of a one-dimensional character. Mohammed Zeeshan Ayyub too is typecast as the best friend/sidekick of the lead and doesn't leave a mark. Mahira Khan doesn't have much to do but does look her part. And Shah Rukh? He shines in a few scenes, but they are mostly restricted to the first half, his performance crumbles as the storyline progresses. Perhaps under the weight of absurdity. We looked forward to seeing him play the quintessential bad guy, instead, he gives us a hotchpotch performance that does disservice to his abilities as an actor. A word about his gait. There's a very odd walking mannerism that he first displayed in Don 2, maybe he thinks it makes him look tough, but right now all it does is remind us of Dev Anand, not for the good reasons. Raees does have its moments, but they are too few and far in between, and by the time the movie's ended you end up wondering if Kaabil would have been the better decision. Fun Fact about the director: You probably know that Rahul Dholakia has won the national film award for the movie 'Parzania', but did you know that his first movie was the Jimmy Shergill-Kim Sharma starrer 'Kehta Hai Dil Baar Baar'? Neither did I. They realize this fact that one should not try to invent any such machine that will take whole mankind towards their disaster.